KIEV, Ukraine -- Ukraine's parliament on Tuesday approved a statement labeling Russia as an "aggressor state," while European Union leaders threatened to widen sanctions against it for continuing to back separatists in eastern Ukraine amid escalating violence in the region. 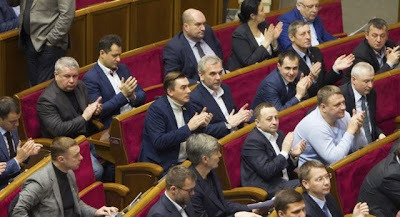 Deputies applaud after Ukraine’s parliament approves a statement defining Russia as an ‘aggressor state,' in Kiev, Jan. 27, 2015. The actions come in the wake of Saturday's shelling of the government-held port city of Mariupol, which killed 30 civilians and wounded around 100, and continued combat with pro-Russian rebels. Ukrainian lawmakers also voted Tuesday to designate the Russia-based separatists' so-called "people's republics" in eastern Ukraine's Donetsk and Luhansk regions as "terrorist organizations." The designations of both Russia and the republics could introduce new consequences on the international stage. Russian Deputy Foreign Minister Grigory Karsin said the vote to label Russia an "aggressor state" was "absolutely irresponsible" and "thoughtless," and aimed at blocking movement toward "a much-needed compromise in Ukraine." To continue its nearly yearlong fight against the uprising in the east, Ukraine's parliament also called for additional nonlethal military aid and tougher sanctions against Russia. All 28 EU leaders, in a rare joint statement, on Tuesday noted their grave concerns about the worsening security and humanitarian conditions in eastern Ukraine and condemned "the indiscriminate shelling" of Mariupol. The Organization for Security and Cooperation in Europe (OSCE) said the rockets that hit the city were fired from rebel-controlled territory. In their statement, the leaders also said they noted "evidence of continued and growing support given to the separatists by Russia, which underlines Russia’s responsibility," and called on the bloc's foreign ministers to consider further sanctions against Moscow. EU finance ministers, meeting in Brussels, on Tuesday approved a loan of 1.8 billion euros ($2.02 billion) to help Ukraine avoid bankruptcy. While the finance ministers probably will ask the EU's executive commission to draft new sanctions, EU leaders would make the final decision over implementation at their February 12 summit. Meanwhile, a Ukrainian military spokesman on Tuesday said nine soldiers have been killed and 29 others wounded in ongoing fighting in eastern Ukraine since Monday, as the United Nations' political chief expressed his concerns the escalating conflict has violated humanitarian law. Ukrainian military spokesman Vladislav Seleznyov on Tuesday said the fighting was the most intense near the strategic town of Debaltseve, northeast of rebel-held Donetsk. On Tuesday, Ukraine's president, Petro Poroshenko, participated in commemorations marking the 70th anniversary of the liberation of Auschwitz in Oswiecim, Poland, site of the Nazi death camp. The Interfax-Ukraine news agency quoted Poroshenko as saying in an address marking International Holocaust Remembrance Day that "the memory of the innocents killed because of their national, ethnic, racial, cultural or religious background demonstrates the international community's determination not to allow awful crimes caused by xenophobia, racism and totalitarian ideologies to happen ever again." Also Tuesday, Russian President Vladimir Putin referred to the Ukraine conflict during a speech at a Jewish museum in Moscow marking the Auschwitz camp's liberation by Soviet troops. "Dangerous and destructive double standards, indifference and lack of concern for the fate of others" are on display in "the current tragedy in southeastern Ukraine," the Russian president said, adding that civilians there are being "shot in cold blood." Putin also accused followers of World War II-era Ukrainian nationalist leader of Stepan Bandera of having taken part in the extermination of Jews in Ukraine during the Holocaust. On Monday, Putin told students in St. Petersburg that Ukraine's army had become a "foreign NATO legion" working to achieve "the containment of Russia." He said the goal "absolutely does not coincide with the national interests of the Ukrainian people." The Russian leader also accused Ukrainian authorities of refusing to seek a "peaceful solution" to the conflict.